Water damage from a burst pipe is not the way I would want to be starting off the New Year! Sadly though, with the temperatures falling here in Southeast Wisconsin over these next few days, that is exactly how some folks are going to be starting off their year. We are going to share a few tips on what you can do today to prevent your pipes from freezing, saving you from potential water damage, along with some tips on what to do if you find that they have already frozen. First though, we wanted to share a bit on why pipes freeze and how destructive a burst pipe can be. Did you know that a 1/8” crack in a pipe can cause about 250 gallons of water to gush out on a daily basis? Imagine the flooding, the structural damage, and the immediate potential for mold damage that those 250 gallons of water can cause. I don’t know about you, but 250 gallons of water gushing into my home, is DEFINITELY not the way I want to start the first full week of January 2015. Following the three easy tips below should help to keep your pipes safe from freezing and water damage. · A trickle of hot and cold water may be all you need to keep your pipes from freezing. Let warm water drip overnight, preferably from a faucet that is located on an outside wall. · Keep your thermostat set at the same temperature during the day and overnight. If you typically turn it down lower while sleeping and the temperatures outside continue to plummet, you could be caught off-guard and find yourself with frozen pipes. · Open cabinet doors to allow heat to reach un-insulated pipes under sinks and appliances that are near exterior walls. · If you turn the faucets on, and nothing comes out, leave the faucets on and call a plumber. · DO NOT USE ELECTRICAL APPLIANCES IN AREAS OF STANDING WATER. You could be electrocuted. · Don’t try and thaw the pipe with a torch or open flame because it could cause fire damage. I said I wouldn’t want water damage to be the way I start out the New Year, but to be honest, I would rather have water damage than fire damage. 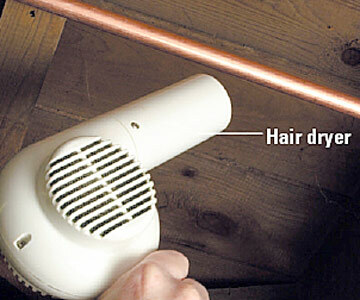 · Try thawing the frozen pipe with the warm air from a hair dryer. Start by warming the pipe as close to the faucet as possible and then work your way towards the coldest section of the pipe. · If your pipes have already burst, turn off the water at the main shut off valve, and leave the water faucets turned on.